What determines the way we would rate our shopping experiences? Is it the mood we took with us? Is it the amount of money we spent? Not likely. Our shopping experiences are greatly determined by the actions stores do or do not take. As a boutique owner, you are in a unique position to give customers exactly what they’re looking for. You can take the actions that determine what kind of experience your shoppers have. Don’t just give them a good experience. Give them a phenomenal experience. The kind that motivates them to tell all their friends and to come back again and again. Zendesk found that 95% of customers tell others about a bad experience and 87% share good experiences (Zendesk). Today, I’m going to do both. I went shopping a few weeks ago to a few different shops and had very different experiences. I want to show you what a difference great customer experience makes so you can provide that in your boutique and win the hearts (and wallets) of your customers for life. When I walked into the shop, the atmosphere was inviting. The clothing was organized and well-displayed on walls, tables, and manikins. The lighting was good, not cold, not too dim. I saw classy black mesh tote bags for shopping hung nearby. I grabbed one and threw in the items I had already picked up. I headed over to the dressing rooms. Once there, I was greeted by a friendly employee who offered to help me if I should need anything. As I tried my different pieces on, I noticed that the lighting was complimentary, the room was beautifully decorated, and it was clean and maintained. Also, very, very importantly – there were plenty of hooks and a place I could sit down. I asked the employee I met as I entered the dressing room for some help. I don’t normally do this but she was friendly and welcoming. She complimented me and made me feel confident, which made me want to keep trying things on. Then, she not only got me different sizes of the same items I was trying on but also handed me a few things I hadn’t thought of trying. I knew it was probably a tactic to help increase sales, but I wasn’t annoyed because it was actually helpful. I ended up buying something similar to what she suggested that I wouldn’t have otherwise. When I left the dressing room, she told me where she had pulled the items from. As I started heading out to look at different color options, she came up behind me and walked with me to those spots. She wasn’t pushy at all, just helpful. I didn’t feel pressured to buy anything I didn’t want to. As I continued to browse, another employee came over to see if I needed anything. I told her I wanted something in white but couldn’t find it. She told me I could order it right from the cash register and have it shipped to me for free. She then showed me how wearing a skin-toned bra under a white shirt was actually better than wearing a white bra under a white shirt. It was actually super helpful. I saw her as an expert on the items in the shop so I asked her about care instructions for some of the clothing items. The checkout process was great. I had to wait in line, but there were some beauty items there for me to look through while I waited and once I was up, the employee at checkout was very helpful. She asked me if I had been helped by anyone during my time there. I told her several people had helped me. She asked if there was anyone, in particular, I could remember. I regretted that I hadn’t paid attention to name tags, but I told her that the person in the dressing room was great. Then I asked her about ordering the white item I had wanted and she set it up for me quickly without any hassle and just added it to my total. She put my items in a beautiful paper bag and put tissue paper on top. She also put in a coupon for 20% off of an item (in-store or online). And, yes, I used it. I spent $130 there. I didn’t intend to spend that much, but I didn’t (and still don’t) have buyer’s remorse. Thanks to suggestions from employees and helpful displays, I found great products that were worth the money. Had the situation been different, I probably would have spent less. When I left, I had a smile on my face, a bag on my arm, and they had a customer for life. I was so excited about the way I had been treated in that store that I was looking forward to continuing my shopping trip. As I walked in the next clothing store, I had a feeling my excitement would not continue. While I was again surrounded by clothing, there weren’t any beautiful displays and the lighting was terrible. It was cold and uninviting. I tried on some boots but had to have my husband use his phone to take photos of me wearing them because I couldn’t find any mirrors nearby. I grabbed some shirts but I had no way to carry them except to drape them over my tired arms which made me hesitant to grab as many as I would have otherwise. When I went to the dressing room, it was falling apart. The lighting was awful; the door didn’t even shut. There were no decorations and the walls and the broken door were just white. I had my husband on the lookout while I tried on some tops with a cracked door. Note: No one came to try anything on while I was there. Which worked out well for me and my broken door, but from the owner’s perspective, that’s a problem. I didn’t talk to a single employee until it was checkout time. I wasn’t even approached by one. I did end up buying a sweater and boots but almost gave up because the checkout process took forever. The employee helping me also felt like it took forever and seemed bored and uncertain of what to do. When I left, I did have a big boring-looking plastic bag on my arm that had some clothing in it, but I was a little unsure of how long the items were going to last and I didn’t plan on coming back anytime soon. If this shop had taken notes from the first one, I probably would have spent a lot more. So, what’s the point? I care a lot about customer service. Partially because I research and write about it for my job and partially because I’m a woman that likes to shop. But mostly because I’m a human that likes to be treated well. I’m not alone. American Express found that “86% of customers are willing to pay more for a better customer experience” (Source). If you really want to create loyal customers, you have to offer fantastic customer service. The good kind that shoppers tell friends about, the kind that brings them back again and again. A Harvard Business Review study found that customers who had the best past experiences spend 140% more compared to those who had the poorest past experience. This is where you can excel and beat out the competition, including the competition with lower prices. Provide that and your boutique will grow. Here are 9 things you can do to turn first-time shoppers into lifelong customers. Create an inviting atmosphere. Use great displays, lighting, music, and decorations to make shoppers want to come in to your boutique. Make it easy for customers to try a lot on. Provide shopping bags (classy mesh totes are great) and avoid a dressing room item limit. Provide a pampering dressing room. Keep it well-maintained, have flattering lighting, make sure there are plenty of hooks, a place to sit, doors that work well, and an employee that’s helpful and not pushy. Help customers discover new items. Whether it be through displays or employee suggestions, help customers find something they hadn’t originally planned on buying. Most of them are looking to do just that; 90% of shoppers are in a discovery phase when they walk in. Train employees – Encourage employees to be friendly and to genuinely compliment shoppers. They should also know the products inside and out. Put smaller items on display near the checkout. Give shoppers more opportunities to discover products they want by placing smaller items for display near the checkout so they can shop while waiting in line. You might choose bath bombs, jewelry, scarves, makeup bags, and other items your customers would like. Make your in-store and online experience seamless. Use a POS that allows in-store shoppers to order things that are not in the store, or need to be special ordered. Your online shoppers should also be able to see what you have in stock so they can confidently come in the store to try something on that they know you have. Dress up their purchase. Put purchased items in a nice paper bag (that includes your logo) and consider adding tissue paper. Customers will appreciate the touch and get even more excited to take home what they just purchased. Bonus: it will provide some advertising for you when they reuse the bag. Give them a reminder to come back. 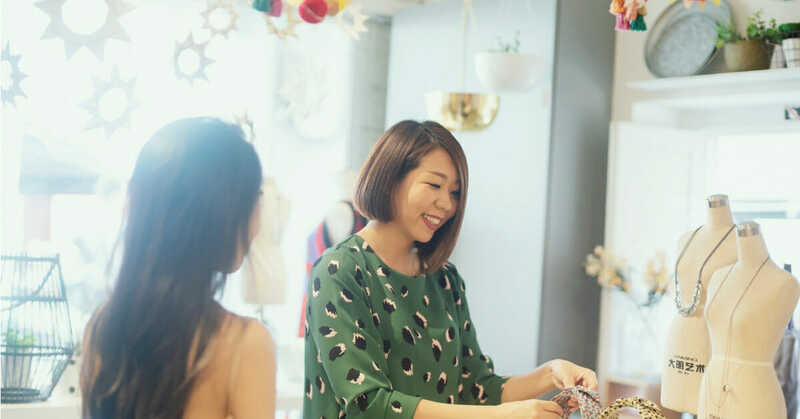 Whether it’s a loyalty program, a coupon in their bag or email, or an upcoming sale, be sure you give customers a reason to make shopping with you a habit. To continue growing as a business, you need to give customers what they want. You need to give them a reason to choose you over the competition. Right now what shoppers want more than anything else is great customer experience. Provide that and you will set your boutique apart and keep growing. You’ll have customers for life that rave about you to their friends on and offline. As that happens, you will see your foot traffic and your online traffic climb. Get excited. You got this! Nikki Casey is a creative writer and content creator who has spent 10+ years in the fashion industry as a runway and print model working with designers and fashion brands all over the world. Her background in communications and marketing, along with her modeling experience fits perfectly with her role creating and managing content as well as building the Boutique.Style platform as Director of Style at The Boutique Hub.